President Donald Trump scorned the “ideology of globalism” and heaped praise on his own administration’s achievements in a speech Tuesday to the U.N. General Assembly. He addressed the assembly earlier Tuesday, asserting American independence from the U.N., a message that was not enthusiastically embraced by other members. He now says he thinks it’s possible for a “very, very great outcome” from the ongoing dialogue between the United States and North Korea. Trump has claimed progress, but so far the engagement has yet to achieve any concrete signs of success to denuclearize North Korea. White House press secretary Sarah Huckabee Sanders tweeted Tuesday that the news conference is set for Wednesday at 5 p.m. in New York. Trump will answer journalists’ questions on the eve of a potentially momentous day in Washington. Supreme Court nominee Brett Kavanaugh and Christine Blasey Ford, who has accused him of sexually assaulting her when they were teenagers, are scheduled to tell their stories to the Senate Judiciary Committee on Thursday. Kavanaugh denies Ford’s allegation, along with a separate claim of sexual misconduct lodged by a Yale classmate. Trump also plans to meet at the White House Thursday with Deputy Attorney General Rod Rosenstein, who oversees the Russia probe. In 2017 Rosenstein reportedly discussed secretly recording the president and possibly using constitutional procedures to remove him from office. President Donald Trump says the political and economic chaos in Venezuela is unacceptable. But he’s avoiding commenting on questions about whether the U.S. would ever intervene in the South American country. Trump notes that the country — once one of the wealthiest countries in the hemisphere — is spiraling downward. Venezuela’s inflation and homicide rates are among the highest in the world and more than 2 million people have fled the violence and conflict in recent years. Trump spoke while attending the U.N. General Assembly after meeting with Colombia President Ivan Duque (DOO-kay). Trump commented on Iran as he met with Colombia’s president in New York on Tuesday. 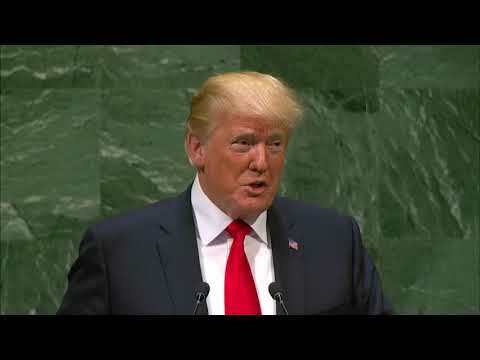 Trump said in a Tuesday speech at the U.N. that the U.S. has begun an “economic pressure” campaign against Iran over nuclear ambitions and behavior in the region. Trump and Iranian President Hassan Rouhani are both attending the U.N. session, but do not plan to meet. President Donald Trump’s address to the U.N. General Assembly has drawn blank stares, headshakes and even laughter from wary world leaders. His opening line Tuesday, as he bragged about how successful his administration has been, was widely laughed at by the assembled group of world leaders. Trump briefly appeared flustered before remarking that it was not the reaction he expected. Trump has long claimed that his predecessors’ weak leadership prompted other nations “to laugh” at the U.S. Some in the audience also grumbled during Trump’s remarks when he said “we reject the ideology” of globalism and criticized nations such as Germany for agreeing to an oil pipeline with Russia. President Donald Trump says he has asked Secretary of State Mike Pompeo (pahm-PAY’-oh) to take a “hard look” at U.S. foreign assistance. Trump said in Tuesday’s speech to the U.N. General Assembly the U.S. is the world’s largest donor of foreign aid “but few give anything to us.” He says that’s why he has asked Pompeo to review the billions of dollars in foreign aid the U.S. hands out each year. President Donald Trump is targeting China, saying the U.S. will no longer tolerate unfair trade arrangements that allow countries to dump their products in America, subsidize their goods, target U.S. industries and manipulate currency to gain unfair advantages. President Donald Trump is asking the world’s nations to join the U.S. in isolating Iran over behavior he deems aggressive. Trump said in a speech Tuesday to the U.N. General Assembly he has launched an “economic pressure” campaign to deny Iran the money it needs to advance a “bloody agenda” of havoc and slaughter in Syria and Yemen. Trump notes the U.S. withdrawal this year from a nuclear deal between Iran and world powers and the reinstatement of U.S. economic sanctions. Trump says Iran does not respect its neighbors or their borders. He says a regime that chants “death to America” and threatens Israel with destruction must not be allowed to have the means to deliver a nuclear warhead. Iranian President Hassan Rouhani (hah-SAHN’ roh-HAH’-nee) accuses the U.S. of adopting a hostile stance toward his country. A year ago at the United Nations President Donald Trump derided North Korea’s Kim Jong Un as “Rocket Man,” but this year his message is different: Thank you. Trump addressed the General Assembly on Tuesday and said he appreciated the steps Kim has taken to denuclearize. Trump notes “missiles and rockets are no longer flying” from North Korea and threatening its neighbors. Trump met with Kim in Singapore in June. The White House is working toward scheduling a second summit. Despite Trump’s praise, the administration has said Pyongyang is slow-walking toward fulfilling the goals set in Singapore. Trump said Tuesday at the U.N. General Assembly he honors the right of every nation to pursue its own customs, beliefs and traditions. He says the United States will never tell other nations how to live, work or worship. President Donald Trump is highlighting U.S. gains under his watch as he opens his address to the U.N. General Assembly — and is getting a laugh. Trump told leaders from around the world Tuesday the American economy is “booming like never before” and his administration has accomplished more in less than two years than almost any other administration. His boast elicited laughter from the scores of heads of state and delegates in the audience for the speech. Questioned as he arrived at United Nations headquarters Tuesday, Trump said Iran has acted “very badly.” He says the U.S. is doing “many things” right now with respect to Iran, including sanctions. Trump earlier this year withdrew the U.S. from a nuclear agreement between Iran and world powers and reinstated economic sanctions. While Trump spoke in sour terms about current relations with Iran, he spoke glowingly of his budding friendship with North Korean leader Kim Jong Un. President Donald Trump is holding up the whole world. Trump ran a bit late for his once-a-year speech at the U.N. General Assembly, forcing organizers to change the order of speakers. Trump was scheduled to speak second at Tuesday’s session, after Brazilian President Michel Temer. Instead, Temer’s speech was followed by an awkward pause as U.N. officials prepared the podium to accommodate the No. 3 speaker, Ecuador’s President Lenin Moreno Garces, who is in a wheelchair. Trump’s motorcade arrived during Moreno’s speech at the U.N. headquarters in New York. The White House did not immediately explain why Trump was late. Trump’s “America First” policies and criticism of allies have clashed with the multilateral spirit of the U.N. General Assembly. Both leaders are attending an annual U.N. gathering in New York. Trump wasn’t specific in Tuesday’s tweet about the origin of the “requests” for a meeting. But Rouhani also has ruled out meeting, telling NBC News on Monday conditions are not ripe for talks. The Iranian leader accuses the U.S. of adopting a hostile stance toward his country. Trump withdrew the U.S. from a nuclear agreement between Iran and world powers and reinstated economic sanctions on Iran. Trump says in the tweet that “Maybe someday in the future” he and Rouhani will meet. President Donald Trump returns to the pinnacle of global diplomacy when he addresses the U.N. General Assembly. Ahead of his speech Tuesday morning, White House aides cast Trump’s New York visit as an opportunity to assert American sovereignty before the multinational body. He is expected to be unapologetic about his decisions to engage with the erstwhile pariah North Korea, remove the U.S. from the Iran nuclear accord, and object to U.N. aid programs he believes are contrary to American interests. On Wednesday, Trump will chair for the first time a meeting of the U.N. Security Council on the topic of counter-proliferation. The four days of choreographed foreign affairs stand in contrast to wild twists and disorder in domestic politics, highlighted by the controversy over Trump’s Supreme Court nominee, Brett Kavanaugh.